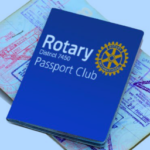 Passport Club is initially sponsored by an existing Rotary Club of their choosing who agrees to serve as a “sponsor” Club. Passport Club has only four business meetings/year, once per quarter. During the other 8 months, they will have a meeting with a partner Club. Have a social (i.e., Happy Hour) meeting each month at various locations. Members are REQUIRED to commit to 40 hours of service each year through projects, fundraisers and/or supporting other non-profit organizations. If the 40-hour service commitment is not feasible due to other personal time commitments, the Passport Club member would consider donating to The Rotary Foundation (TRF) each year. Passport Club members are responsible for paying Rotary International and District 7450 dues (currently $149.16 a year). Additional Club dues may apply. Members also encouraged to donate a minimum of $10 per month to the Rotary International Foundation through Rotary Direct. The Passport Club will have a President, Immediate Past-President, President-Elect, Vice-President, Club Secretary, Treasurer and additional Directors. The Passport Club will also have a Service Director who will record each member’s service hours each month. Induction of new members can be performed at any time. This is a Club idea that can be tweaked to fit what works for our District but the framework is solid and proven successful in its first year of existence. “This is an innovative approach to membership and you have to shoot to score”. Error: Error validating access token: Session has expired on Friday, 01-Mar-19 13:00:41 PST. The current time is Wednesday, 24-Apr-19 21:29:34 PDT.